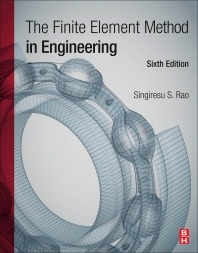 The Finite Element Method in Engineering, Sixth Edition, provides a thorough grounding in the mathematical principles behind the Finite Element Analysis technique—an analytical engineering tool originated in the 1960's by the aerospace and nuclear power industries to find usable, approximate solutions to problems with many complex variables. Rao shows how to set up finite element solutions in civil, mechanical and aerospace engineering applications. The new edition features updated real-world examples from MATLAB, Ansys and Abaqus, and a new chapter on additional FEM topics including extended FEM (X-FEM). Professional engineers will benefit from the introduction to the many useful applications of finite element analysis. Mechanical Design, Optimization and Reliability in Mechanical and Structural Design, Finite Element methods, Structural Dynamics. 2. Uncertainty models in engineering analysis, design and optimization. 4. Finite element and meshfree methods. 5. Optimization and reliability of renewable energy systems.